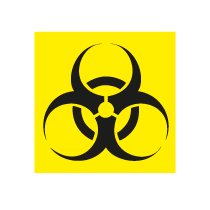 Biohazard Symbol – also known as biological hazards is a symbol that refers to biological substances that pose a health hazard to humans and animals. The symbol is generally used as a warning, so that those who are exposed to the elements can take precautions. The biohazard symbol was developed in 1966 at the initiative of environmental and health engineer Charles Baldwin at the Dow Chemical Company. He had observed that there were many different types of biohazard-related signs and thought it was dangerous, because few people knew their meaning. He therefore started to design a standardized symbol using "Dow packaging design team”. "The only guidance I gave them to noodle through were, it must be unique and something that would be striking enough that it would be remembered., We wanted to develop something that was" memorable "but" meaningless, "so we could educate people about what it means. " Baldwin and Dow packaging design team then made several extensive user testing to determine which one was the most memorable of the symbols that they came up with.